In an ever growing world of web content, website speed is becoming a standard for consumers to gauge quality. Lengthy load times and poor response times detract potential eyes from your aspiring website. Let's get into the nitty-gritty and see how fast is fast? ‍If an e-commerce site is making $100,000 per day, a 1 second page delay could potentially cost you $2.5 million in lost sales every year. 46% of users will never return to poor performing websites. Now those facts can either be very reassuring or immensely concerning. The bottom Line is if you have a slow website, you're potentially losing half your customers. Not Good! How do I prevent or fix a slow website? Seeing that the science is in on what drives away users, let's look a few tactics on bolstering up an audience. When creating a website it stands to reason the more elements your site has to load, the higher its load time will be. That is why finding a balance is imparative, a photography website with no picture is overkill! There's no point of having a fast website if there's nothing to see. Minimalism doesn't mean lacking in design, it just means proper use of technique. VVolex Design uses plenty of MinimType image caption here (optional)Here is an example of how we used MinimHere is an example of how we used minimalistic design for our site, and still managed to use an interactive imagWe use a lot of minimalism design for our website. And we still manage to use just the right amount of interactive imagery.We use a lot of minimalism design for our website. And we still manage to use just the right amount of interactive imagery.Type image caption here (optional)sdfsdfMinimalism and flat images are apart of our core website design but we still incorporate interactive imagery throughout. Minimalism and flat images are apart of our core website design but we still incorporate interactive imagery throughout. Wikipedia is a perfect example of minimalism design. From its homepage, when we enter a term in the search bar, let's say "lion". It takes just under a second and a half to get to the Lion Page. Looking at the Pingdom speed test, we can confirm that this is true! Even in web design, perception is reality. This means that designs that are merely perceived to be highly usable don’t necessarily have to be blazingly fast in order to produce high levels of user satisfaction or a perceived, excellent UX. In the users eyes, the perception of a fast site equals a fast site. What you need to know about the perception of a fast website. Do not disregard your design just to get your load time under 1.5 seconds. Your actual load speed affects your search engine ranking, so don't merely rely on perception. How can your website look fast? How to make an Awesome Loading Screen for your Website. Should keep attention - This is the difference between a white blank screen and a engaged user. 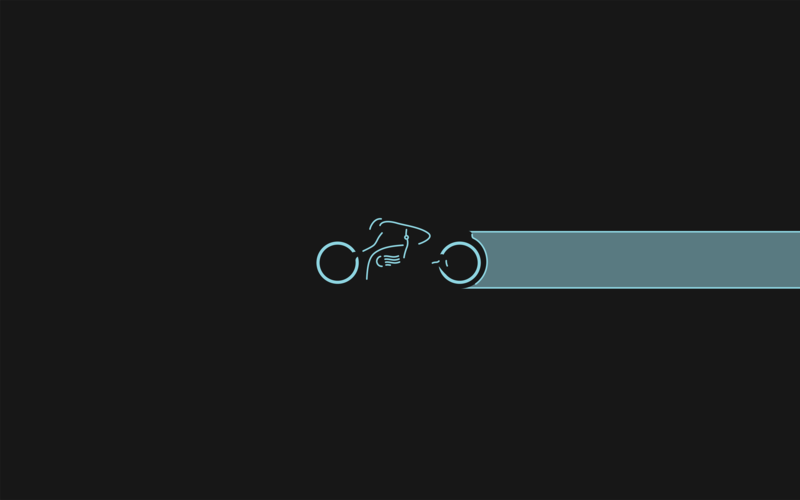 We added a background text so a user knows where they arrived and we then added a motion rocket with quick animations to give the perception of loading. This keeps the user's attention and allows any computer fast or slow to feel as though they are on a fast website. Google wants your site to be faster. That would help its overall mission of making the Internet faster, which it promoted when it released its compression technology called “Brotli” last year. 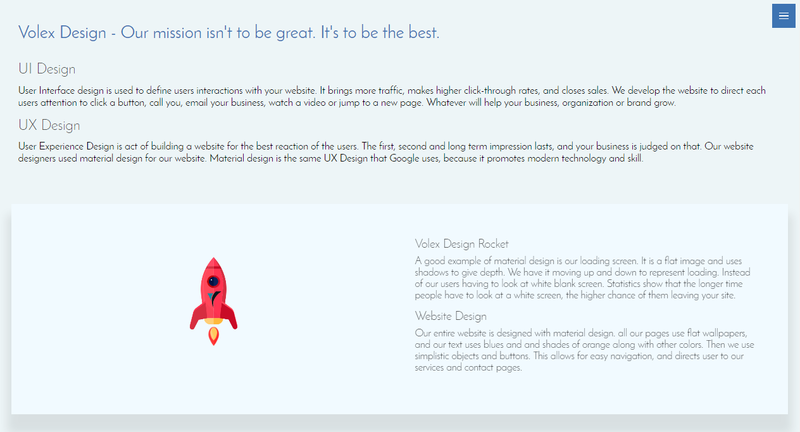 So why not use the amazing tools that Google is offering you as a web designer? Google Search Console gives you the majority of the information you need, along with much more! Pingdom is our go-to speed tester. It is easy to use and gives your website a rating on more than just speed. It also gives you a rating and tells you how to speed it up! We are happy to say Volex Design received an performance grade of an A. Even though we have an interactive, colorful, and animation heavy site, we still have a faster site than 84% of all sites. That goes to prove with the right website designers, your website can look exactly how you want it and still load very fast. Average number of http requests: 89. Here is our pingdom stats. This wasn't easy to achieve, but it sure was worth it! Our Competitors, aren't competition. They lack in Grade and Speed, which neither can be forgotten. A slow site is a deserted site. Fast sites get more users, more customers, and more clients calling for your service. Designing for speed can’t be stressed highly enough these days! It’s 2016, your users, buyers, or readers want a fast user experience. Otherwise, they’re bound to go to one of your competitor’s sites that has been optimized for quickness! Of course, keep testing your site to see that it really is the fastest possible iteration that you can create. There are always tweaks you can make here and there to keep it as fast as possible. Hire Volex Design, and your bound for a fast and amazing site.